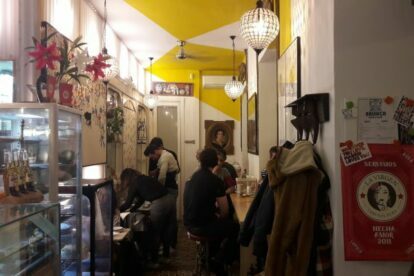 Recently, I have found myself blogging about new places in Madrid with this idea in mind: they must tell a unique story. Or at least this is what I try to do. Wandering through Malasana district one day, I came upon Café Farmacia and its façade just caught my attention. And the story behind the place is as interesting as the tiles in the front. It used to be a pharmacy and lab back in the day, almost 100 years ago. The owners have kept the furniture and structure of the old pharmacy, and have refurbished what was necessary. Meaning that the old tables and bottles are still visible, as well as the original tiled floors and doors so the place feels really authentic. And that’s what I love about this coffee shop. The building façade is protected by the City Hall, making the entrance and look from the outside unique and charming. But then, it can also feel modern. Cakes are home-made in a bakery close by, being my favorite passion fruit cheesecake. Coffees and teas are served with special care and if you want to try the daily menu it is already available. Their weekend brunch is a must, I hear. The owner is very nice and welcoming, the music is the perfect companion and wi-fi is available in case you need it. As I said, modern but unique. Give it a try.